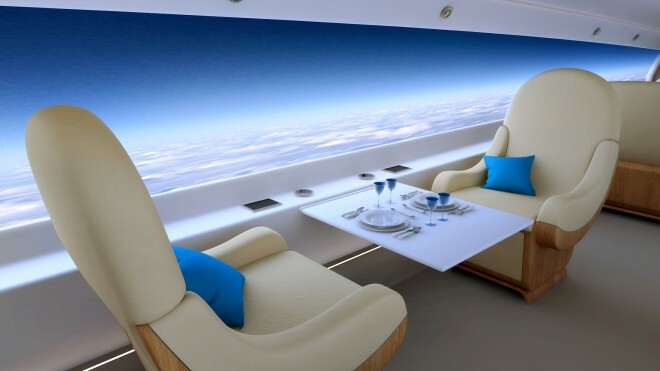 The Boston-based aerospace firm is taking advantage of recent advances in video recording, live-streaming, and display technology with an interior that replaces the windows with massive, high-def screens. The S-512’s exterior will be lined with tiny cameras sending footage to thin, curved displays lining the interior walls of the fuselage. The result will be an unbroken panoramic view of the outside world. And if passengers want to sleep or distract themselves from ominous rainclouds, they can darken the screen or choose from an assortment of ambient images. But this isn’t just a wiz-bang feature for an eight-figure aircraft. 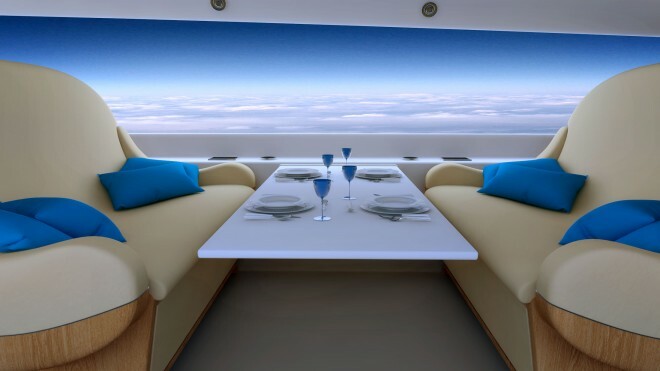 While windows are essential for keeping claustrophobia in check, they require engineering workarounds that compromise a fuselage’s simple structure. And that goes two-fold for a supersonic aircraft. An airplane is stronger sans windows, which is one of the reasons why planes carrying military personnel or packages fly without them. Putting passenger windows on an airplane requires meticulous construction — the ovular shape, small aperture, and double-pane construction are all there to maintain cabin pressure and resist cracking while flying 500 mph at 35,000 feet.